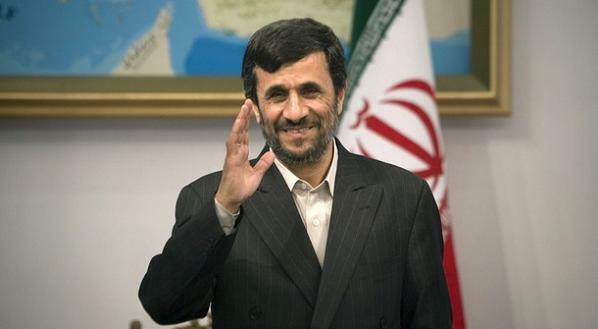 In a visit to Baghdad Iranian President Mahmoud Ahmadinejad proclaimed that Tehran and Baghdad have an "exceptional" security role to play when it comes to the regions security. The red carpet was rolled out for his visit. According to a statement on Iraqi Prime Minister Nuri al-Maliki's website the Iraqi Prime Minister told Mr. Ahmadinejad that "Iraq supports peaceful solutions for all the problems in the region." He went on to tell Ahmadinejad that Iranian companies are welcome to participate in the reconstruction of the Iraqi state. Mr. Ahmadinejad's presidential term is due to end next month when he will be succeeded by President-elect Hasan Rouhani. Iddon is back. and someone brings message about "...toxic and resentful nature...". Iddon's previous article about (allegedly) murdered teenager boy, was apparently meant to create a catalyst for a revolution in absence of NEDA S.
It would be interesting to find some info about Neda's "handler" Mr. Caspian Makan. Looks like Mr. Iddon have skills and lots of time during his "absence", and it would be an interesting assignment for him. Actually Iran today has more credibility in the region as US war crimes and human right abuses are turning even their puppets against them. US/Zionist agenda of causing sectarian violence is the region is causing massive destabilization and will result in blowback in spades. US now is a global failed state and an imploding pariah while Iran has kept its cool and used soft power, which under Dr. Rohani will be more pronounced. A US watchdog group called ‘the Constitution Project‘ (TCP) has released the most detailed and revealing report on US torture practices so far. .. toxic and resentful nature ?!!! Come on A-F, this is the most neutral of all Iddon's postings. Turn off FOX/CNN dude, the Arabs hate the US rednecks and just look at the burning US flags in these demos. No wonder you delusionals don't get it. Only Turkey and Zionists along with US support these Salafi "brotherdood" as they are the ones who created them. Fox news is not telling that political Islam is dead; Assad saying that; Political Islam is the invention of US - that is what Assad is saying; so at the end; USA wants you to be anti-american --> that is why your anti-american; you are wrong if you believe that your anti-americanism makes you attractive for some one else. Alwahdawi newspaper quoted on Friday, saying that Al Saud regime plans to dispatch thousands of Yemeni,Pakistani and Egyptian workers to Syria in order to materialize the West’s plot to overthrow Syrian government, Al-Alam reported. Many foreign nationals from Saudi Arabia have been deported due to their refusal to go to war in Syria and preferred to go back home, the report says. Some of those who refuted to fight against Syrian army soldiers have been sent to jails in Saudi Arabia, according to the Yemeni newspaper. Over one million Yemenis are working in Saudi Arabia, facing pressure to follow up Al Saud regime’s policies. Khalid Issa, European representative of the National Coordinating Body, told al-Alam that there are some Saudi agents in Syrian city of Ras al-Ayn near Turkish border, which proves Saudis’ role in supporting Salafi terrorist groups in the city. The city was one of the terrorist al-Nusra Front bastions which witnessed fierce fighting between Kurdish militants and al-Nusra fighters in the past couple of weeks. Kurdish militants with the assistance of Syrian military announced last week that they have defeated al-Nusra and have the city under their control. Issa said Saudi Arabia, Qatar and Turkey make use of terrorist militants to halt national reconciliation among Syrians. The mostly foreign instigated Syrian unrest, which took in terrorist groups from across Europe, Australia, the Middle East and North Africa, has transpired as one of the bloodiest conflicts in recent history. Washington has remained indifferent about warnings by Russia and other world powers about the consequences of arming militant groups and the certain blowback to follow.